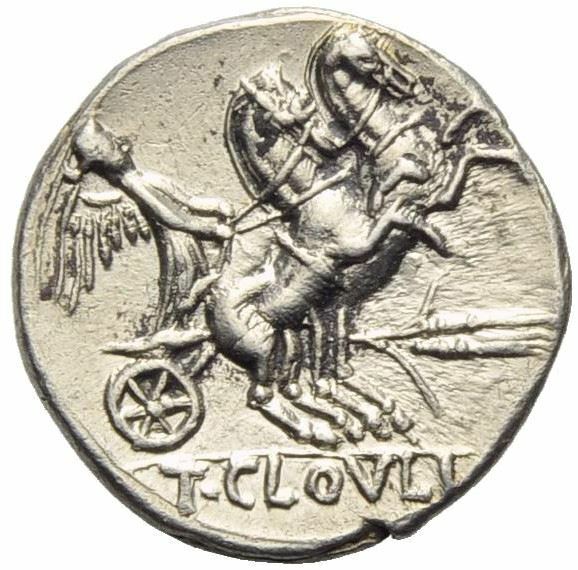 T. Cloulius (or Cloelius) was one of the moneyers for the year 128 BC. He is not otherwise known. Gens Cloelia, originally Cluilia, and occasionally written Clouilia or Cloulia was a patrician family at Rome. The gens was prominent throughout the period of the Republic. The first of the Cloelii to hold the consulship was Quintus Cloelius Siculus, in 498 BC. The Cluilii were one of the noble families of Alba Longa, where they succeeded the royal house of the Silvii. According to legend, Numitor, the grandfather of Romulus and Remus, was deposed by his brother, Amulius, and his sons were slain. When the princes had grown to manhood, they killed Amulius and restored their grandfather to the throne. As he had no surviving sons, it may be that upon Numitor's death the throne passed to the Cluilii.